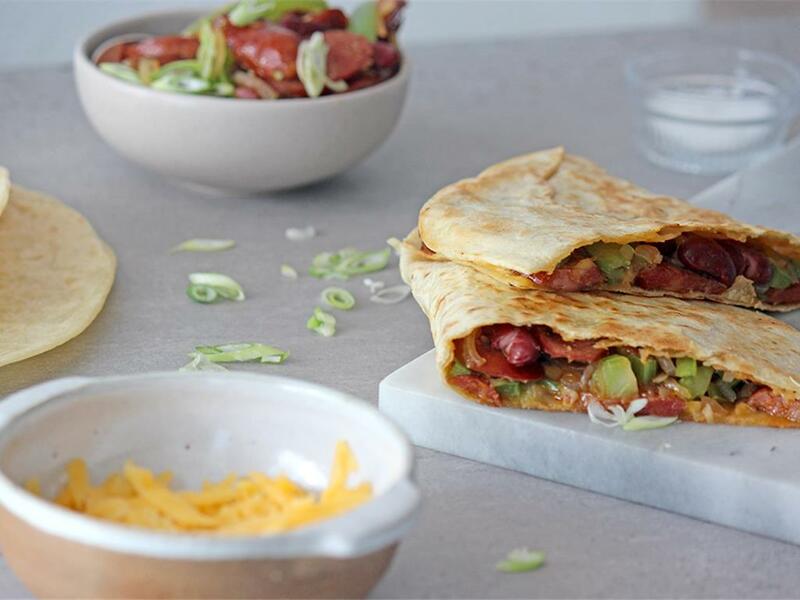 Toasted wraps filled with spicy chipotle, kidney beans, chorizo & melted cheddar cheese. Chorizo & kidney beans: Place a pan on medium-high heat with a drizzle of olive oil. Add the onion with a pinch of salt, oregano, garlic and chorizo and cook for 5 minutes. Then add the celery, kidney beans, green peppers and tabasco and sauté for another 3 minutes. Season with salt and pepper, then add in the spring onions. Wrap: Place in a dry pan on medium-high heat and spoon in a portion of the chorizo & kidney beans. Scatter over the grated cheddar (make sure you get some of the cheese all the way to the edges of the wrap). Fold the wrap in half (the melted cheese will help the wrap stick together) and toast for 1 minute a side. Use and egg lifter to flip the wrap gently, to toast on the other side. Serve the frijoles while they’re still warm.